Lobi Stars all-time scorer, Tony Okpotu and his management team, MatchRoom Sports & Media, have turned attention to Charity with an innovative campaign, “Score for Charity” to enable him assist disadvantaged children. Okpotu becomes the first Nigeria Professional Football League player to announce a Charity initiative. “Football should serve as a tool to change the society. Moreover, it gives players the opportunity to make people happy and that’s the objective of the Score for Charity campaign. “I am honoured to be involved in this with MatchRoom as we turn to children,” Okpotu said in a statement released by MatchRoom’s Communications Department. “Every goal scored by Okpotu will be valued at N3,500 and the total amount based on the number of goals scored will go to a Charity of his choice. With this in mind, we expect him to improve from the 14 goals scored so far,” CEO MatchRoom, Ojeikere Aikhoje, stated. The free scoring forward hit a historic record of 65 goals to become the club’s all-time scorer and the only player in the NPFL to score double hat-tricks this term. 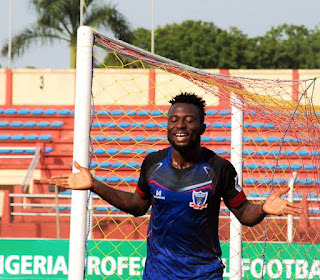 To underscore his quality, Okpotu was named NPFL Player of the Month of July by the Influential League Bloggers Award (LBA). Okpotu will be out to score more goals for Charity when Lobi Stars play El-Kanemi Warriors, in the NPFL, on Sunday.